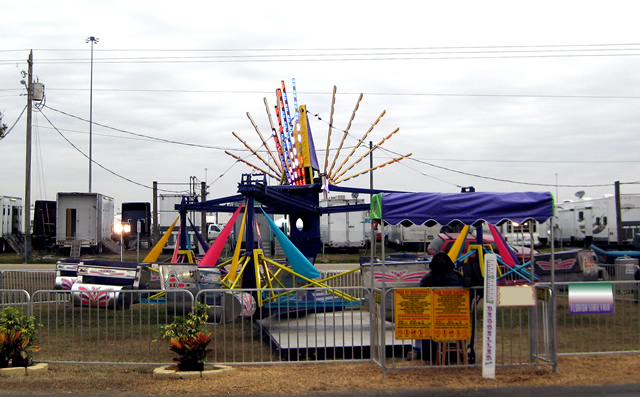 Marenna Amusements operates a wide selection of bright, attractive, colorful rides and attractions. Take a look and see what we have to offer below. More rides are consistently being added and are available to help make your event a success. We can even supply an indoor carousel or train in your mall, store, or even your restaurant. Contact us for more information. 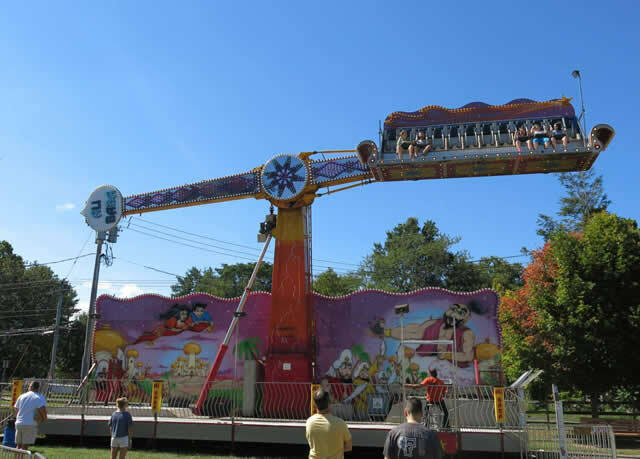 Riders sit in stadium style seating on three rows and enjoy the free falling feeling as they are lifted into the air on this giant magic carpet ride. As the ride motion begins, the vehicle slowly starts to rock left and right until it reaches its full height of 50ft. At full speed, riders can experience the sensation of weightlessness as the vehicle descends from full height. 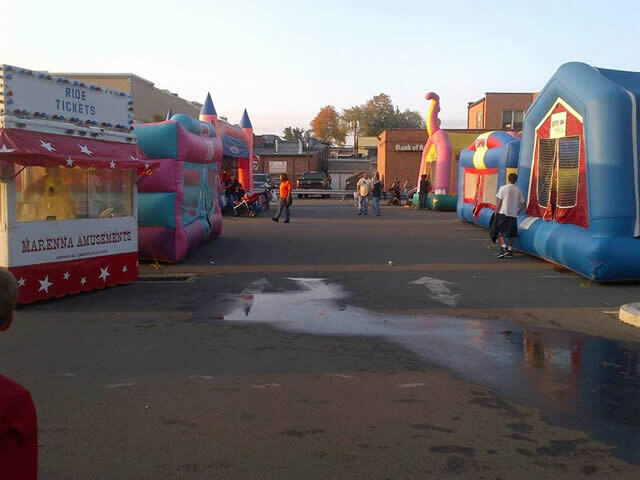 We have over 10 different varieties of blow upbounce houses. The Cliff hanger provides its riders with the thrill of hang gliding. The Cliff Hanger has ten passenger carriers which can accomodate three adults or three children. When the ride reaches full speed, it lifts into the air flying you at an angle, safely gliding through the air. Children and adults can ride prehistoric creatures as they rotate around a lit-up volcano. Must be 42" or taller to ride without an adult. Under 42" must be accompanied by and adult. Riders must be over the age on 1 to ride. 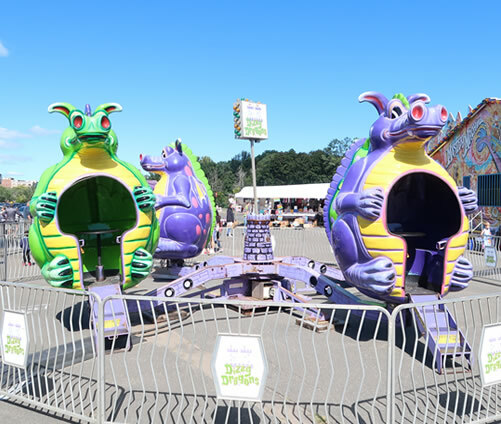 Climb into one of these giant dragons for an easy, pleasant ride. Four friendly dragons revolve independently while the entire ride slowly turns in a gentle circle. If you would like a little more excitement grab on to the wheel in the center and you can make the dragons spin faster. Great fun for kids and parents alike. Must be 42" or taller to ride without an adult. Under 42" must be accompanied by and adult. 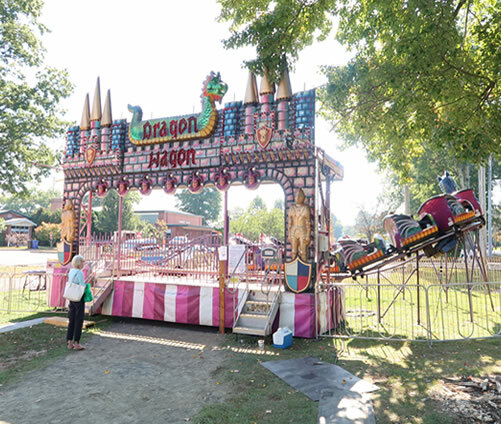 With a delighted dragon leading the way, the DRAGON WAGON is an exciting Dragon themed children's roller coaster ride for children and parents alike. 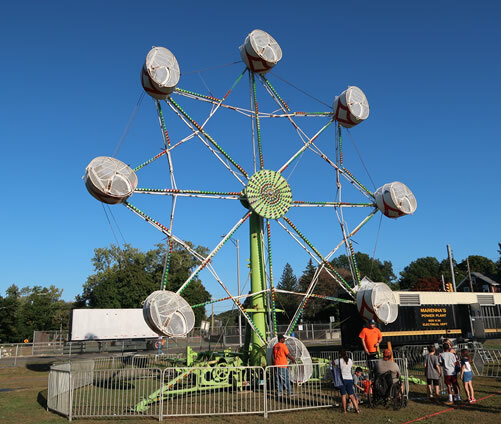 Expo Wheel dominates the midway day and night, offering patrons a sweeping view from high over the midway! Passengers are seated in separate gondolas seating up to four riders each and then whisked smoothly over the top and down again, reminiscent of a ferris wheel. 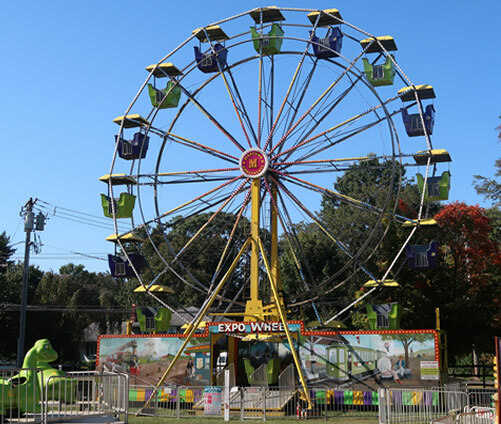 The Expo Wheel is a pleasant ride for the entire family. Must be 48" or taller to ride alone. Under 48" Must be accompanid by an adult. 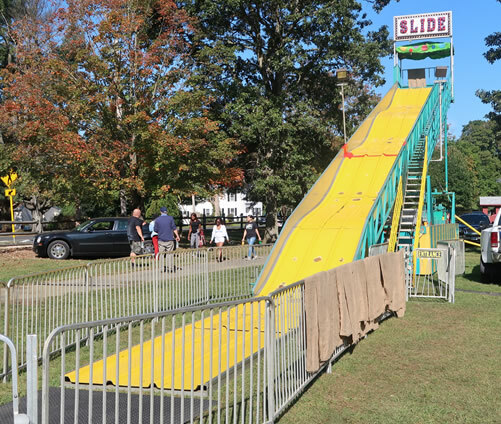 The Super Slide is a tall four hump slide that kids and parents alike can race down in burlap sacks. A key feature on this ride is its unique rider-seats that are enclosed and rock and roll as the ride turns. If the rocking builds sufficient momentum the seats will flip upside-down and end-over-end, patrons are able to control their free-spinning seats with a brake. Kids will love to fly in the these friendly flying elephants! Must be 36" or taller to ride without an adult. Under 36" must be accompanied by and adult. 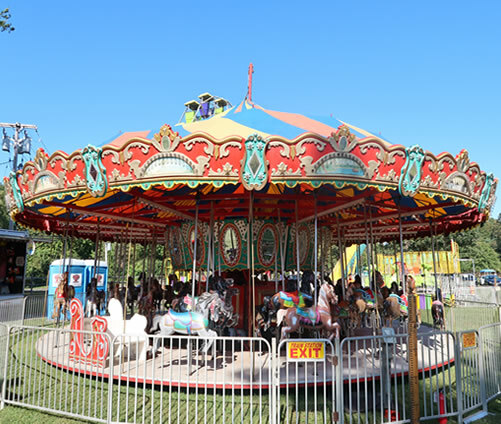 The larger of the two we own, this carnival tradition features three rows of beautifully painted carousel horses than any child young or old will be excited to ride. 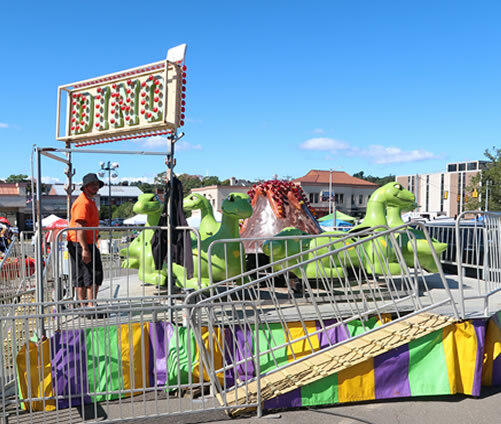 The ride also features two chariots that allow for parents to sit with their children as they ride, or even just watch as their children ride upon the horses. 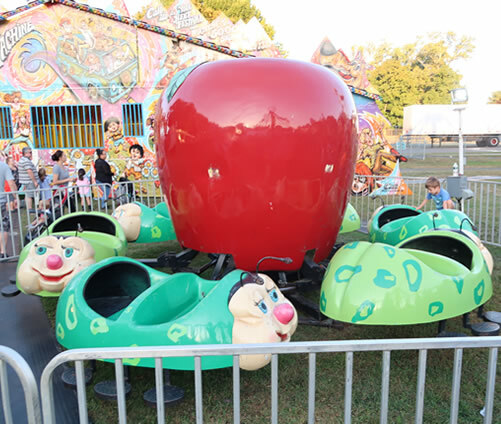 The Granny Bugs is a classic kiddie ride for the little ones. The oversized bugs go round and round while gently moving up and down! Must be 36" or taller. 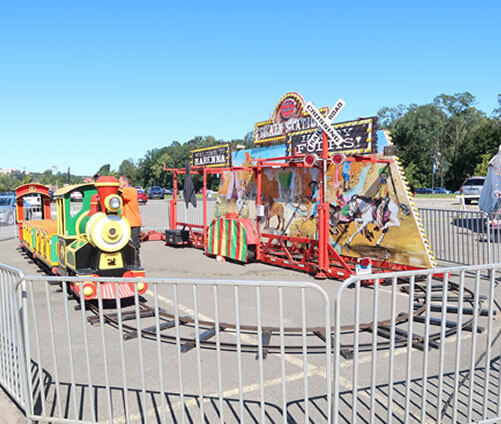 Children will love being behind the wheel of their very own fire truck, jeep, mustang, Model T Ford, or School Bus as they circle around on this kid favorite ride! 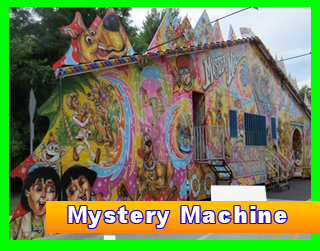 This is a relaxing kid friendly ride that is designed with the little ones in mind. Sorry mom and dad, this is a KIDS ONLY ride. This ride is great for your future chopper pilot. It puts your child in control of the chopper. Push the control lever forward the chopper goes down, pull it back, the chopper goes up. Which news channel will your little pilot work for? Must be 36 inches to ride with an adult, 42 inches to ride alone. 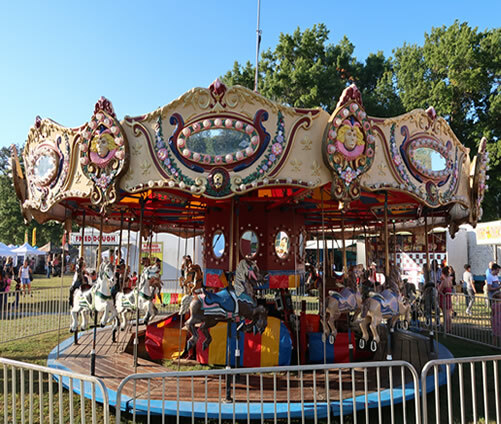 The smaller of the two we own this Carousel features two rows of beautiful horses that gallop in a circle! 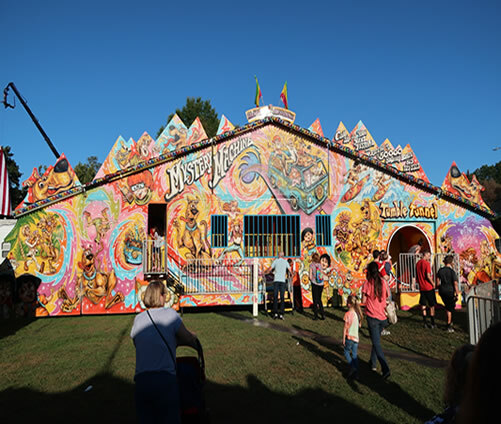 This fun house is a fun filled fun house attraction complete with moving floors, rubber band maze, punching bags, trick mirrors, and a rotating barrel! Must be 42" or taller to ride without and adult. 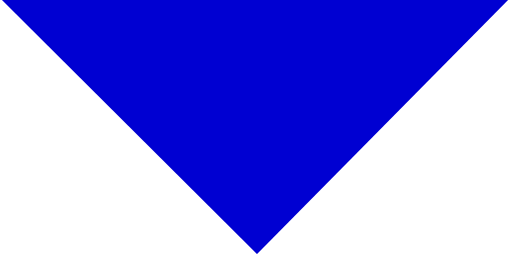 The Paratrooper gives riders the sensation of parachuting out of the sky. As the ride begins to rotate, lifting to a horizontal 45 degree angle, the ride vehicles swing outward as they parachute through the sky. For an added thrill, the Paratrooper also rotates in reverse. Must be 48" or taller and over the age of 6 years old to ride without and adult. If you are between 36" - 48" you must me accompanied by an adult. Under 36" can not ride. 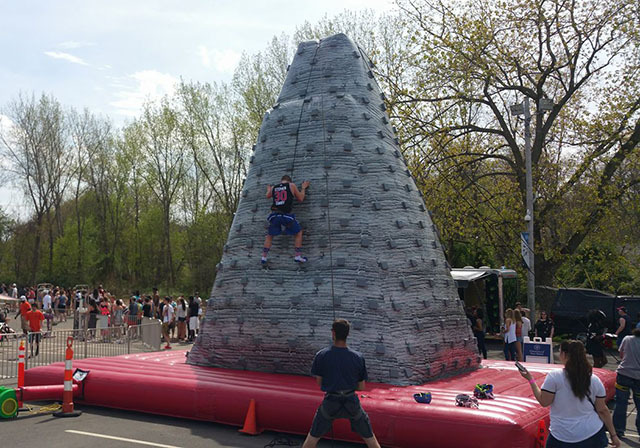 Challenge yourself to see if you can make it to the top of the rock! Must be 42" or taller to climb the wall. Kids will be excited to ride this safari themed train covered in giraffes, lions, zebras and more! Rides 42" and over u can ride alone...under 42 needs an adult. 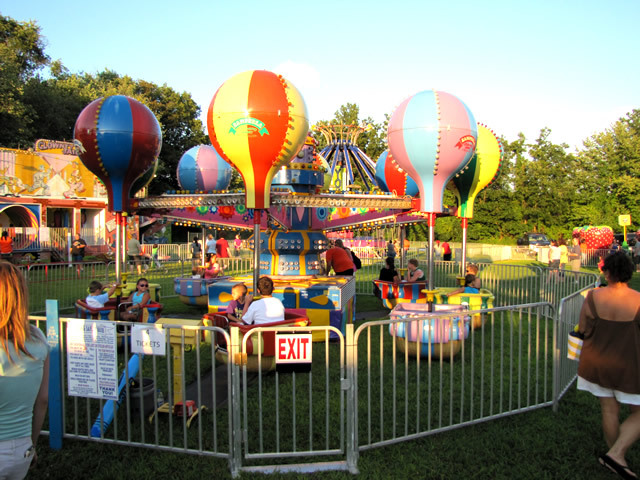 The Balloon Race is a great kids ride in which kids take part in the action by being able to spin their balloon as they ride. This kids ride features hot air balloon carriages and is truly a marvel to look at. The bright lights make it especially magnificent to look at during the evening. The Balloon Samba seats 32 children across 6 air balloons. Fluffy white cloud cut-outs and bright, smiling suns grace the safety barrier and give kids the illusion of floating up in the sky. 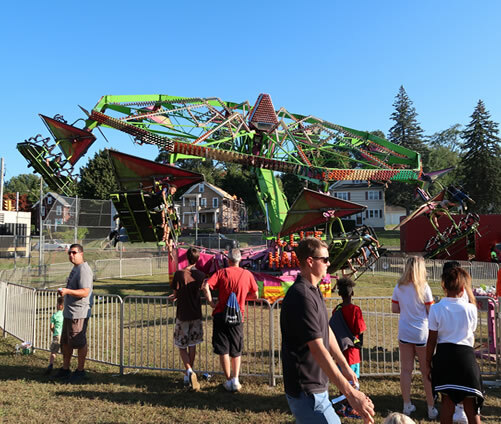 The scrambler has 12 seats, each seat capable of holding 3 people.Since its inception in the 1950s, the Scrambler has proven itself to be a popular attraction on carnival and amusement park midways throughout the world. As the seat spindles spin, so does the center of the ride giving riders a mutli action experience. The Scrambler still remains a family favorite. Must be 48" to ride. 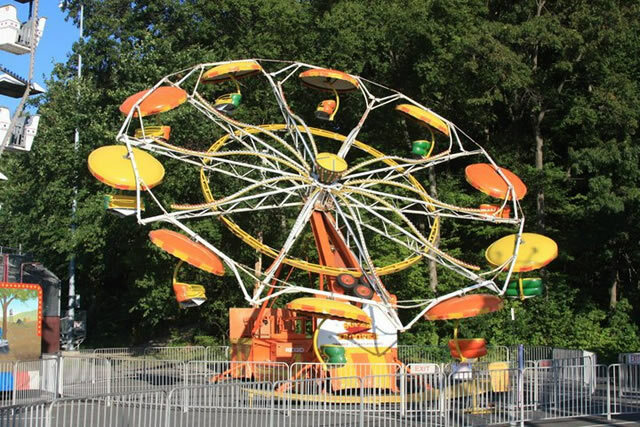 The Tilt-A-Whirl is a classic amusement ride in which 4-5 passenger tubs rotate around a circular track as the platform moves through hills and valleys. Fun for all ages; even suitable for Grandparents and Grandchildren. 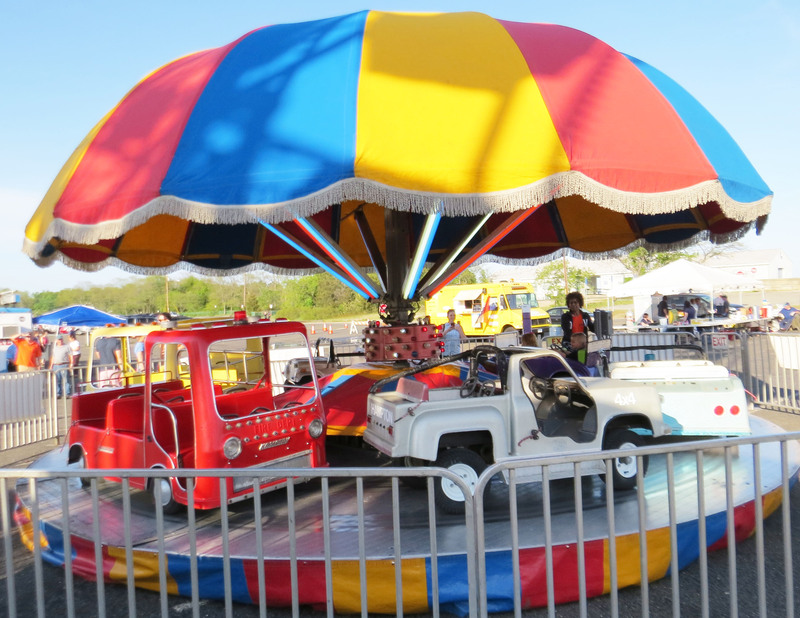 Watch everyone laugh and scream as they twist and twirl around on this midway classic. You must be 48 inches to ride. This ride is perfect for young kids and even adults. 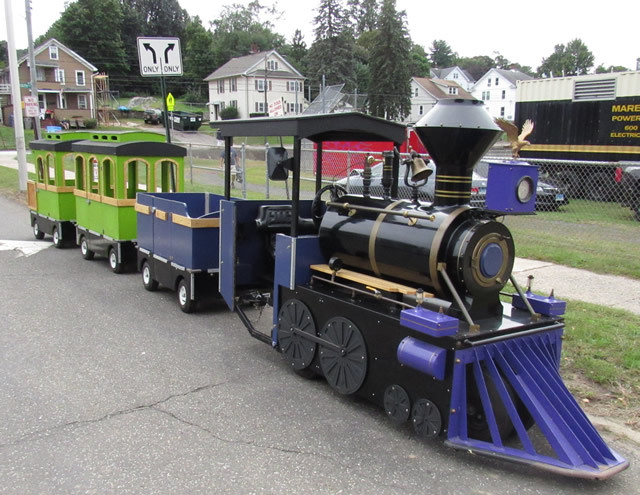 Our trackless train has 3 cars and holds up to 12 people comfortably as they are riding around enjoying the event. 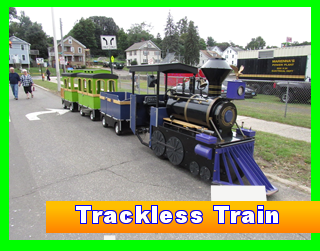 Our trackless train can run on cement, asphalt or grass. Must be 30" or taller to ride without an adult. Under 36" must be accompanied by and adult. All Aboard! Hop aboard the Rio Grande Train. 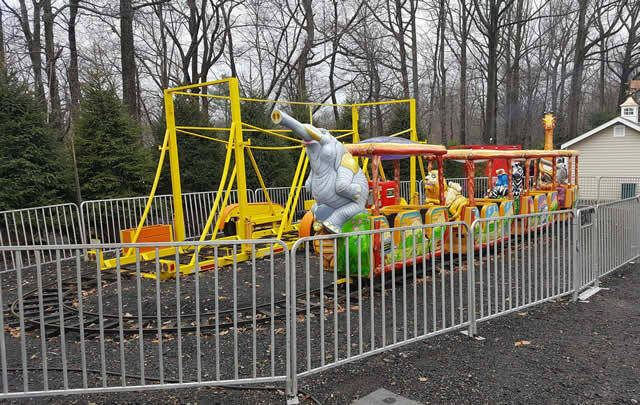 Kids will love our kid sized train. 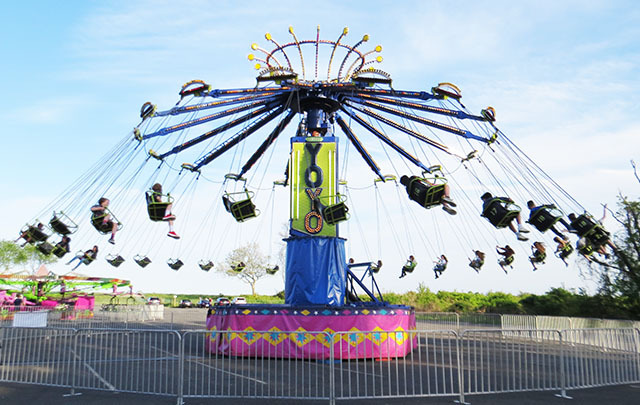 Our Yo Yo is one of the tallest swing rides featuring 32 free swinging seats. When the ride begins to spin, the swings swing outward. Must be 42" or taller to ride. Less the 42" can not ride. 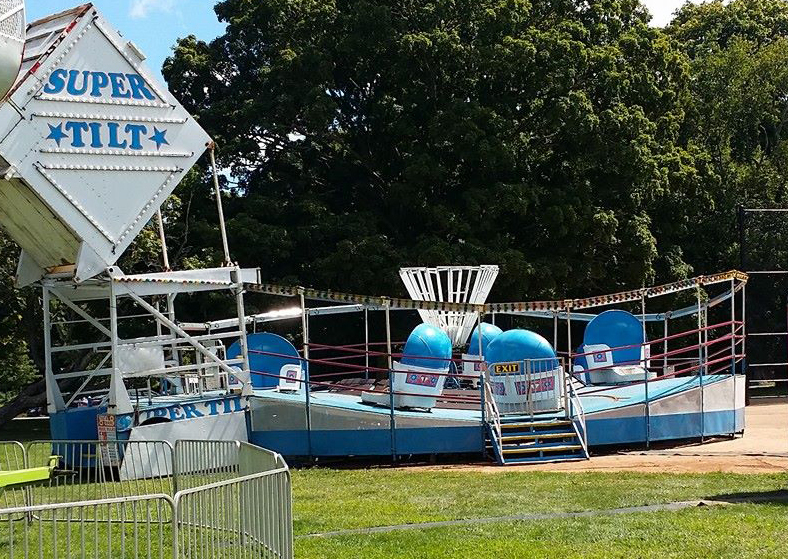 This family ride that holds up to 33 people. and spins in a circular motion. 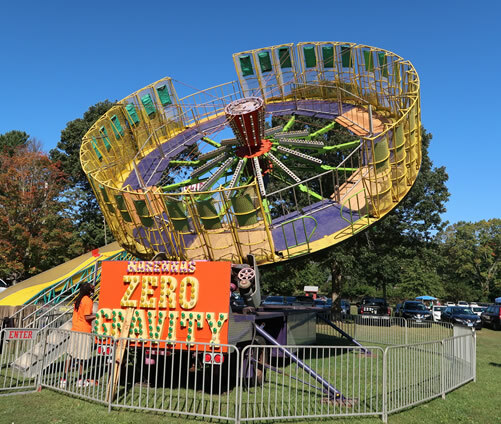 Once it has reached maximum speed, the center of the ride lifts up producing a zero gravity feeling.